I had been waiting and I had been waiting for a long time. The debut Eight Moons was a complete out-of-the-bush gonzo-surprise of a decade in its impeccable quality and readiness in both musicianship and composing. So needless to say, the follow-up The Empires Of The Worlds had some high mountains ahead of it. The opener Enemy Within promises excellent things to come. Eerie sound effects morph into furious riffing and awesome drumming that alternates easily between jagged rhythmic jabs and full-on double bass-insanity. The guitar solos scorch magnificently. John K still displays the same Geoff Tate-like emotion&wailing-meets-Phil Anselmoish-aggression in his vocals, which might just be even better then on Eight Moons, which sounds absurd in thinking just how übergood they were already on the debut. The guy is a natural talent and one of the top metal singers out there today or on any historical scale. Unfortunately, that’s about the only thing here that clearly trumps the debut. Well, almost the only thing. The title track begins. Nice tribalesque drumming and pretty good grooves throughout. John banshees out like Halford ever has. Atmospheric keyboards give some good variation and background meat to the bones of the tune. But on the whole, I don’t feel a hook. I cant get a grip of the tune. An unfortunate fluke, Im thinking. But the same thing continues on Assaulter and Relinquished Destiny. Yes, its heavy, its fast on Assaulter, its grooving on Relinquished Destiny (although I must nitpick and say that the opening main riff in this track is horrible, ruins the tune for me), but my senses are not going “Man, Ive just got to hear that again at least ten times!” Long Time Dead saves me from this pit of frustration with its mellow Queensryche-stylings, especially in the clean guitars. Very good song. Then it starts again. Regenerated, DNA Metastesis, Survival and Existenz all roll by with amazing technical prowess and quite original nuances with the keyboards and sound effects, but my neck doesn’t feel the jar. My nerves don’t feel the burn. Im pulling my hair out at this point, because tens of listens and I just cant get into them. Truth Denied luckily knocks me down from my disbelief by putting the thrash metal-gear into full blast and pulverizing everything in its way. Excellent stuff, especially with the drumfire. Still at this point I had a fear that “yeah this is good but doesn’t hold a small garden light to Eight Moons”. But then the closing epic, “Absolution”, comprised of four parts, blasts out, and the whole album does a one-eighty. Final Offence is an instrumental with monumentally twisting orchestrations, tempo changes, manic guitars and great spacey atmospheres. From The Abyss is a short, ominous spoken-word interlude, that is a great lead-off into Absolution, one hell of a humongous song. As much symphonic movie-score as it is metal, the grandiose choirs are like straight from a Star Wars-flick or Lord Of The Rings. Atmosphere truly is the word of the day with this one. One can really imagine being in the middle of some huge space battle or time warp, and as the focus changes into the acoustic guitars and following mid-tempo chugging with John K screaming his heart out, the album steps into a whole new level. Now THIS is what Im talking about! The closing track, Disintegration, does its demanding job following up a piece like Absolution well, with bulldozing heavy grooves and mucho-super guitar work. Basically, the final four that is Absolution mercilessly destroys the rest of the album, maybe even trumping the majority of Eight Moons. Unfortunately for a quote, the entire album doesn’t meet these standards. The Empires Of The Worlds as a complete work is much more brutal and "chomping" then Eight Moons, but I feel on the way the band left out a lot of the melody and some of the innovative futuristic elements that ruled Eight Moons. Well, excepting the final four tunes of course, which rip ultimate booty. There is also the fact that this sophomore effort lacks the "ultimate hit scorcher" that was on the debut in the form of Do You Know Me. 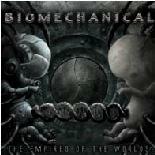 This record proves that Biomechanical still have the unique touch to make them one of the top metal bands out there, but it doesn’t come into full bloom with The Empires Of The Worlds. Still, if you enjoyed Eight Moons, this is very worthwhile to acquire, and in comparing, if you don’t mind some of the memorability changed for balls-out heaviness, it’s a must have. Id still say is a must have for John Ks performance and the Absolution-saga alone. Looking forward to the next one, as the potential is limitless.